If someone were to harvest all of the resource from a field, I expect they would begin consuming stock at a place far away from their commanding area while moving towards it, to make it easier to transport the gathered supplies to their final destination near the center of operations, unless they were in a long march or a rout. The harvester would, in effect, be constantly moving away from the dessification, and scraping up everything on the way to it’s headquarters. With more than one central location present, the even, row-by-row threshing of the early agriculture becomes more of a “swiss cheese”, “hole vs. hole” model, where the most rapidly expanding hole always wins the cheese inside of the bordering wrapper. The applications for military strategy and maneuvering, as well as agricultural efficiency, are boggling. Keeping all of this in mind, it can be deduced from analogy that the center of any given hole in a block of swiss cheese actually contains less than your run of the mill empty space, as I believe could be verified with a thermometer. 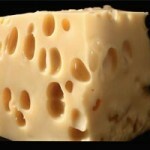 It might be a good idea to cut out the holes before you consume your cheese and throw them in a scrap pile, lest you be internally consumed by an exceptionally hungry bacterium. A gaping hole where you would expect to find a delicious delicacy, such as a riveting sporting event, is what happens when cheese fails. Why are mineral patches so stacked, Blizzard? How about a REAL race for wealth, with scarcity as a gameplay element?